A little while ago, I received a few Utopia's Polish and although it has taken me longer than I would have hoped to publish them, it does not prejudge of how awesome they are! P.S. 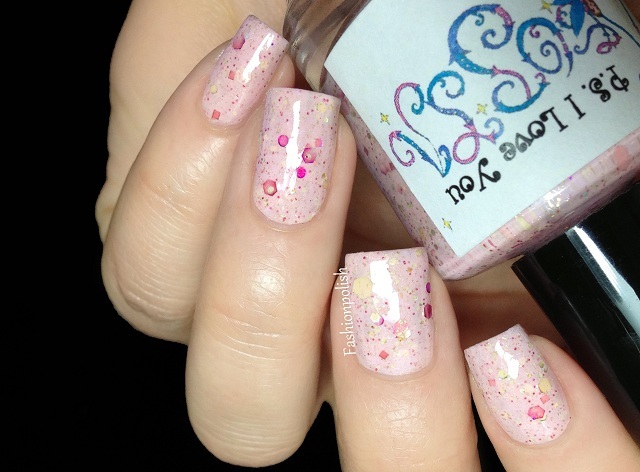 I Love You : delicate pastel pink creme with a strong mix of pink, gold and holographic gold hex glitters. Two coats plus topcoat in these swatches. 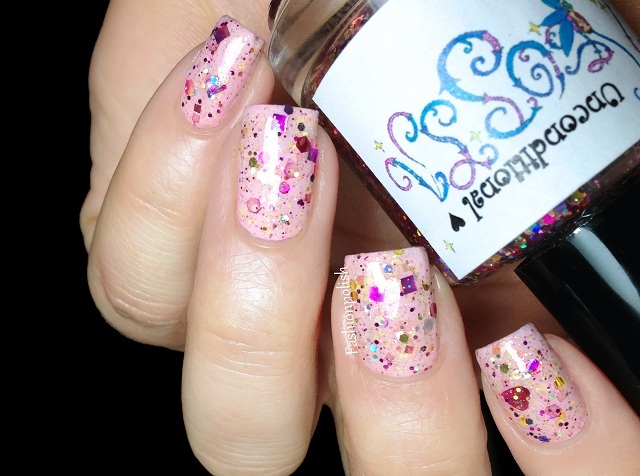 Unconditional ♥ : glitter bomb of mainly pink and gold glitters in various shapes and sizes in a clear base, including cute little hearts! Two very thin coats over P.S. I love you plus topcoat. Warrior Princess : fuschia jelly with a blend of purple, red, pink silver, white and holo glitters in different sizes of squares and hexes. Two coats plus topcoat below. 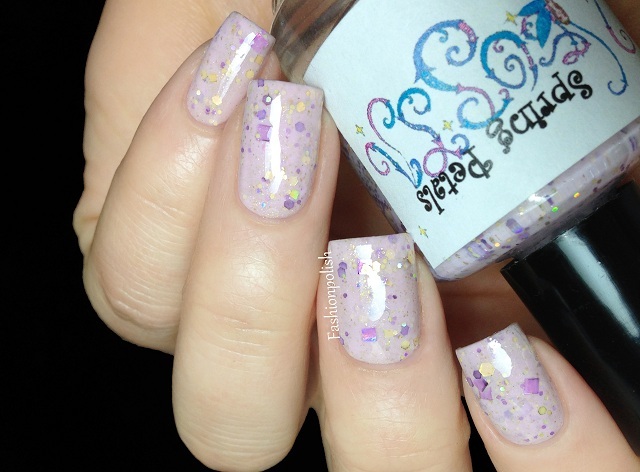 Spring Petals : soft pastel lavender creme packed with purple and gold glitters in various shapes and sizes. Two coats plus topcoat as well. Happy 2013 : tender baby blue creme leaning turquoise with a multicolored rainbow of hex and square glitters. Also two coats plus topcoat in these swatches. I really love the heavy saturation of glitters in Utopia's Polish but what I probably love the most is the perfect balance between the different sizes of glitters : from micro glitter to bigger squares or hexes. They all look extremely complex and yet subtle and delicate! Formula was flawless, they all applied easily and reached full opacity in two easy coats. Warrior Princess, the jelly was a bit less pigmented but still looked good at 2 coats. Also, no glitter fishing or placement necessary, apart from the hearts in Unconditional but even then they were fairly easy to grab. Utopia's Polish can be purchased on Etsy and retails for $9 each. For more information such as new releases and restocks, please refer to Utopia's Polish on Facebook. They all look beautiful, but Happy 2013 is my favorite!!! these are my type of polishes! love them! Wow I love these! Thanks for posting- spring petals is my fav! Love Ps I Love you and Spring Petals. Beautiful swatches! Warrior Princess and Happy 2013 are gorgeous!